I managed to leave the book I was reading on the kitchen table this morning. Nathan Jones' White Sky, Black Ice turned up in the post at work, however, so I headed to the airport this afternoon to fly to London with high expectations after the review I read over at Reactions to Reading a couple of weeks ago. The book I was reading was so-so. I'm a 150 pages into WKBI, set in a small Alaskan town and introducing State Trooper Nathan Active, and I'm thoroughly enjoying it. I think there's probably legs in this series, assuming the second half continues in the same vein. More when I've finished. So far though, so good. In Winterland Alan Glynn manages to intertwine two criminal cultures of Ireland – the gangland underworld and the boardrooms of corrupt developers and political cronies. It’s a searing social commentary on Irish life, full of keen observational insight and emotional depth. Glynn writes with deceptively engaging prose, appearing quite ordinary but actually well layered and lyrical. The principal characters are all nicely developed, with full contextual back stories. The plot was well structured and despite the story being framed as a thriller that links a disparate set of characters it is very believable. One of the things I found quite fascinating is that Winterland is not a whodunit or even a howdunnit. The reader knows pretty much from the start who did the killings, why and how. They also know the answers to the secondary story. And yet, Glynn manages to maintain and ratchet up the tension throughout. It was an interesting approach and worked surprisingly well. The story is slightly flabby in places and could have done with a little tightening, and the ending felt a tad weak even though it had nice symmetry, but these are minor issues. Overall, a very entertaining read that provides real insight into twenty first century Ireland. 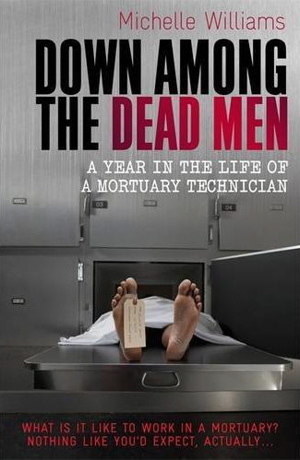 I'm just finishing off Michelle Williams' Down Among The Dead Men: A Year in the Life of Mortuary Technician. It's not the descriptions of eviscerations and postmortems that is making me squirm, but rather the way in which some people die. The description that has stuck in my head is of a doctor who's patient has died and his treatment is being investigated. If your squeamish, stop reading now. The doctor fearing he is going to be struck off, takes his jeep and backs it up to a tree. Then he ties a rope around the trunk, threads it in through the back door, leaving a lot of slack, and ties it around his neck. He then revs the vehicle and drives off. Ouch! I can't seem to dislodge that image from my overactive imagination. They stare at the envelopes, all of them clearly bills or statements. ‘Yeah, but they shouldn’t have lent us so much. Jesus!’ He kicks the door. ‘What difference does it make? They’ll be taking it back off us soon.’ He kicks the door again, cracking the wood. ‘Niall.’ Her head feels like it is going to implode. Eddie Dare is a downwardly mobile lawyer working in San Francisco, with two divorces and one son. One day a photograph arrives in the post with his head circled. Soon after a man turns up looking to hire him to find 400 million dollars that was removed from the South Vietnam’s national bank vault in the last days of the regime. It seems that he was a member of a company of American marines who unknowingly transported the money to Thailand. There it and his company commander, Captain Austin, disappears. Only Austin has recently died and now the US government, the Vietnamese and other interested parties are in a race to find the money. They all think that Eddie either knows where it is or can locate it. Persuaded to travel to Bangkok for a finder’s fee, Eddie arrives into a lively city with his fellow marine veteran, Winnebago Jones. Very quickly they’re floundering around trying to find the money and to stay alive. The Big Mango was Needham’s first novel and it and his subsequent novels have all sold well in Asia (for some reason Needham refuses to allow his books to be published in North America). It’s competently written and plotted, with some relatively straightforward prose, some nice observational passages and occasional comic flourishes. Dare is a rather ordinary character and it’s the folk around him who add the colour. Bangkok is well detailed and there’s a good sense of place, giving a view of the city from a Western perspective. The plot was simple enough, with effectively four groups chasing down the money, intersecting at various points, and it comes to a nice, tense conclusion. There were a couple of niggles - one team dropped from view towards the end and the thread dealing with Dare’s relationship with his son is never fully developed. Overall, an enjoyable romp. Two DVD box sets turned up in the post yesterday (if you only have four TV channels, they're great backup viewing) - Moonlighting and Northern Exposure. I was somewhat surprised to see that they first aired when I was still a teenager (Moonlighting 1985, Northern Exposure 1989). Watched the pilot episode of each. Both comedy dramas. They've dated a little, especially Moonlighting, but they both still work because of the chemistry between the actors. 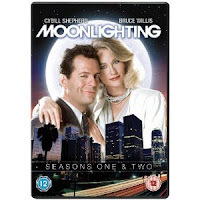 The story in the Moonlighting pilot was very weak and some of it is as cheesy as brie, but the vibe between Bruce Willis and Cybill Shepherd makes it work and its good fun. 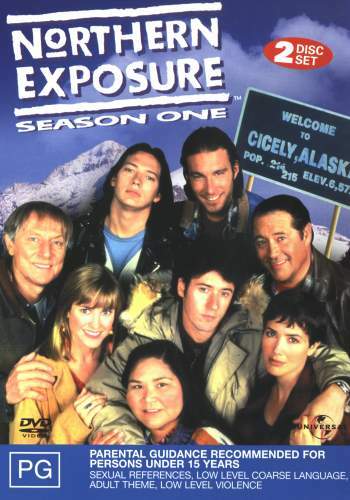 The end of the Northern Exposure episode just fizzles out as if there was no attempt to close the opening programme. Rob Morrow though carries the episode as the New York doctor out of place in Alaska. Looking forward to working through these over the next year or so. After a blitz through Jake Needham's The Big Mango (review later in the week), I bit the bullet and started Alan Glynn's Winterland last night. I'm 100 pages in and it lives up to my high expectations. Glynn has a got a keen observational eye and like Gene Kerrigan perfectly captures the social and political relations in Ireland. If, as Declan Burke is suggesting over on Crime Always Pays, Glynn's next book, Bloodland, is just as good, if not better, then it's going to be one heck of a read. Thankfully, in my own as yet unpublished novel on property development and corruption in Ireland, I concentrate on the rural midlands. With regards to Dublin, Glynn and Kerrigan have been there and done that. I've been toying about writing an academic book on housing, property and planning in Ireland. I think I'll just tell the students to read their novels. They'll get the same insights without the dryness. Forty years into the future and the once great city of Bohane, on the Irish west coast, is ridden with tribal factions fighting for power and control. For years, Logan Hartnett has been the godfather of the Fancy, unofficially ruling over the city and its various vice activities and maintaining a wary peace. Hartnett’s authority though is coming under challenge from within his family and the Fancy, and from the families on the Rises and a returning nemesis. To maintain his position requires all his cunning and savage skills as various feuds play out in a post-apocalyptic landscape. Kevin Barry is well known for his short stories. He has a vivid imagination and is an excellent wordsmith, crafting some lovely, expressive prose. City of Bohane has received high praise from some of Ireland’s literary stars such as Roddy Doyle, Joseph O’Connor and Hugo Hamilton. I therefore had high expectations for Barry’s first novel. With the exception of the prose and some of the characterisation, for me, it failed to deliver. For the most part, the characters are difficult to identify with and I couldn’t have cared less what happened to them; they're a bunch of scoundrels hooked on vice and violence. The tale has no back story. We’re forty years into the future, Ireland seems to have slipped backwards a couple of hundred years minus the colonial rule, and we have no idea as to why this occurred or the general wider socio-political landscape of Ireland or Europe. Rather we’re isolated in a fictional city, with the sea on one side and surrounded by bog otherwise, and all we have is a nostalgia for a ‘lost-time’ that’s never explained. The plot is wafer thin and is largely feuding clans seeking to remain in charge of the city. My sense when I got to the end was, ‘yes, and?’ Given the literary plaudits, I was expecting a lot more and yet there is no great sociological, political or economic unveiling, no sense of philosophical or theological reflection, no feeling that story served any purpose. Barry does manage to create some sense of place, but the city is very simply structured into five zones, lacking the complexity of a real place and it’s really not clear how large a town it actually is. It felt quite small town to me, certainly not a large city. There is also a first person narrator who drifts in very occasionally and seemingly with no purpose. Barry rightly deserves the plaudits for his ability as a wordsmith, and there are some very nice passages in City of Bohane, but as a novel length story for me it fell short of what it could have been. 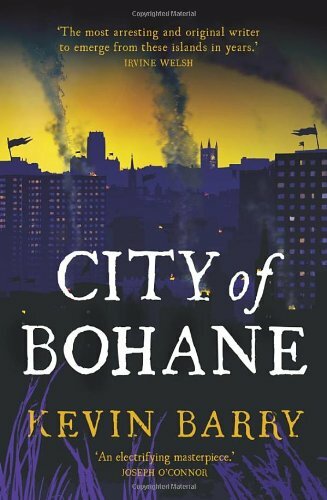 I've just finished reading Kevin Barry's City of Bohane. It is adorned in cover quotes by literary stars who all say that it's a masterpiece. Roddy Doyle states it's 'brilliant.' Joseph O'Connor waxes that it is 'an unforgettably wonderful novel ... an electrifying masterpiece.' Niall Griffiths argues that it 'beautifully illustrates, the mad glory of the human imagination. It should be met with parties and parades and pyrotechnics.' Hugo Hamilton says it is 'an extreme adventure in pure language and fictional daring.' Irvine Welsh thinks Barry is 'the most arresting and original writer to emerge from these islands in years.' I've just finished writing my review. Suffice to say, I'm at odds with the literary greats. My view is more in line with that I've just found in the Independent - 'City of Bohane, for all its surface brilliance, turns out to be such a letdown.' Which is a real shame as I so wanted to like it more than I did. Barry is undoubtedly a very fine wordsmith, but much more is needed for a satisying novel than a great turn of phrase. I'll post my review tomorrow. In the meantime, are there any books you've read where your opinion of the book radically differed to the cover quotes? It seems to be happening to me quite a bit these days. Cold. Wet. Dark except for the flickering dance of honeyed light. Clinging to the lee of a ditch, covered in mud and god knows what. The shuffle of boots on the tarmac above. Waiting. Waiting. Praying. Whispered voices, a distant shout, feet running. Count to ten, a deep breath, glancing left and right, silhouetted figures disappearing round a bend. Up and across the road, over a barbed wire fence, trousers snagging, ripping, blood beading. Into a stand of old birch trees, glancing back. The flames reach up for the stars. 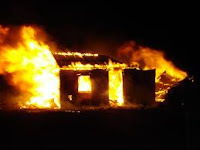 What was home is gone. Shouting. Shots. Blood pumping quick. I've been meaning to read Alan Glynn's Winterland for a while. First, I put it to one side because I was writing my own novel concerning property corruption in Ireland. Then, I left it there because I didn't want to do any comparisons that might set my heart sinking, especially since all the reviews I've seen of it are very positive. I've decided to bite the bullet and move it to the top of the pile, in part because it's the first in a trilogy and I'm interested in the second book in the series, Bloodland, which is just about to be released (Sept 1st). A tabloid star is killed in a helicopter crash and three years later a young journalist is warned off the story. A private security contractor loses it in the Congo, with deadly consequences. In Ireland an ex-prime minister struggles to contain a dark secret from his time in office. A dramatic news story breaks in Paris just as a US senator begins his campaign to run for office. With echoes of John Le Carré, 24 and James Ellroy, Alan Glynn’s follow-up to Winterland is another crime novel of and for our times – a ferocious, paranoid thriller that moves from Dublin to New York via Central Africa, and thrillingly explores the legacy of corruption in big business, the West’s fear of China, the role of back room political players and the question of who controls what we know. Marion Seeley is married to an older man, a doctor with a morphine addiction. Struck off from practising, her husband has abandoned her in Phoenix and headed to Mexico to work for a mining company. Living in a guest house, Marion finds work in a medical clinic where she meets Louise, a woman who lives on the edge and by her wits. Louise invites the lonely Marion to the parties that she and her housemate, the sickly Ginny, host in which they entertain some of town’s most powerful men. The three of them quickly become friends, Marion spending ever more time at their house. At one of the parties Marion meets Joe Lanigan, a well connected businessman and womaniser, and falls for his charms. Unable to resist, she takes ever more risks that puts her on a murderous collision course with her friends, who rely on Lanigan to stay above the breadline. Bury Me Deep is inspired by the notorious 1931 ‘trunk murders’ crime. It follows certain factual aspects of that story to frame the narrative, but the story itself is fiction and the ending is substantially different. There is plenty to like about the book, but the real strengths for me are the prose, the pace, the character development, and the plotting. Abbott is clearly something of a wordsmith and the prose is very nicely written. The pace is even and relenting, where it could have been rushed. This I think allows the story and characters to develop and the rationale for the crime that occurs about three fifths into the story to become clear. The characters are all well penned, especially the three lead women and their developing relationship, and the plot is well constructed with a good sense of historical detail. The only thing that seemed to be missing for me was a strong sense of place and geography. I had to keep reminding myself that it was set in Phoenix. I just got no real sense of the town or its landscape or indeed its social organisation and people beyond there being a group of important men that ran the place. As a result, the book felt a little decontextualized, reduced to the relationships between the four main characters and the distant Dr Seeley. Nevertheless, this is superior crime fiction and is well worth checking out. I finished Megan Abbott's excellent Bury Me Deep last night. As with Eoin McNamee's Orchid Blue, which I posted about earlier in the year, I'm still not sure what I think about fiction that's based on real crimes. Bury Me Deep makes it very clear that whilst some elements of the book are true to the crime in terms of what was reported at the time and in subsequent true crime books, a lot of it is imagined and the ending is completely different. Funnily, I have much less trouble with biographical films, except where they radically alter the history. Bury Me Deep is a kind of alternative history crime novel. Very good, but for whatever reason the fact that it was so strongly based on the infamous 'trunk murders' I found somewhat unsettling. I think it's something to do with family and living legacies. I don't know; it just seems unnerving somehow. Maybe I shouldn't have looked at the author notes at the back of the book until I'd finished reading the novel. Funny what unsettles one's comfort zone. Review tomorrow hopefully. Declan Burke is working on a new novel when Billy Karlsson appears in his back garden. Karlsson claims to be a character in one of Burke’s previously unpublished novels, a hospital porter with a sideline in euthanasia taking part in a did he/didn’t he kill his girlfriend plot. Burke’s initial response is that this is some kind of weird piece of performance art – that the supposed Karlsson has somehow got his hands on a version of the abandoned novel. What Karlsson wants is for Burke to re-draft the novel with his help; to make it out of the purgatory of a manuscript left languishing in a drawer and to become published. Playing along with Karlsson’s performance, Burke helps Billy rework the manuscript. If euthanasia isn’t enough to get the work accepted then Karlsson is going to blow up an entire hospital. On the jacket cover, John Banville states that Absolute Zero Cool is a cross between Flann O’Brien and Raymond Chandler. I think it’s more a cross between Flann O’Brien (the Irish satirist) and Declan Burke, author of Eight Ball Boogie, The Big O and Crime Always Pays – satire and high art meets screwball noir. The nearest comparison for the existential, literary plot-play I can think of is Jasper Fforde’s Thursday Next and Nursery Crimes novels. Whereas Fforde plays with literary theory and intertextuality, Burke uses Greek mythology, theology and philosophy to deconstruct and satirise the life of a writer, the crime novel and contemporary society, especially the Irish health system. The result is a very clever book, that’s at once fun and challenging. The prose and plot has been honed within an inch of its life, full of lovely turns of phrases, philosophical depth and keen observational insight. I wouldn’t classify Absolute Zero Cool as a page turner – it’s far too cerebral for that – and the middle of the book is a little ponderous as various pieces are moved into place, but it does have a coherent plot that tugs the reader to the somewhat inevitable end. That’s no mean feat given how postmodern the tale is, but does reveal that the book is, as Burke insists in the text itself, a crime novel and not simply a literary conceit. Absolute Zero Cool takes the crime genre and its many tropes and stereotypes and throws them out the window. It’s a genuinely unique tale. It certainly won’t be for everybody, but for those crime readers who like to be pushed and challenged this is well worth a look. Five stars all the way for me. You know you've asked an academic to take a look at a piece of your fiction when their first comment is: 'I think you need to flesh out in more detail the main character's ontological crisis in finding a dead body.' So that's what I've been doing this morning. 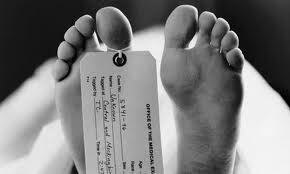 Examining the ontological crisis of waking up next to a dead body. The questioning of one's self, one's mortality, and one's relationship to the world. At least, that's what I'm assuming he meant. So, here's a scenario for you: You wake to find the dead body of someone you've never met before in the bed next to you. How do you react? Appropriately enough I finished Absolute Zero Cool last night on the train to Sligo, the setting for the book. I'll write a review sometime over the weekend and post on Monday. I need to try and get my thoughts ordered. It's one heck of a novel - a postmodern crime tale mixing noir, Greek mythology, theology, philosophy, satire and heaven knows what else. And the prose is exquisite. A book where every section seems to have been worked over and honed until it is shines. A book designed to make you think. It won't, I suspect, be for everybody. It's not a light beach read, but for those wanting to be challenged then this is definitely worth checking out. And it's not just me who thinks so. Here are the glowing reviews from today's Irish Times and Independent. Winter in Northern Greece and the bones of Santos Volakis, the foremost poet of his generation are being exhumed, the family gathered to pay their respects and receive their due from the will. In the coffin, however, there is a surprise for the mourners. Back at the family house, Volakis’ agent finds a set of new poems and he hires a detective, Hermes Diaktoros, to investigate the mysterious circumstances surrounding the exhumation. Hermes is soon digging around into the life of Volakis and his family when a body is discovered in the grounds of a local church. It seems the local police are confused, but Hermes has a strong inkling as to what has happened; all he has to do is prove it. The strength of The Whispers of Nemesis is the evocation of place and community. Zouroudi places the reader firmly in Northern Greece, its culture, social relations and culinary delights. There is an interesting range of characters, but it tends to be the side characters who appear fuller and more engaging, for example, Hassan the taxi driver. The main character, the Hermes Diaktoros, is left somewhat anaemic, defined more by his clothes and appearance than his personality and backstory. In fact, we get no backstory and throughout he’s somewhat illusive. The prose is engaging and well expressed, though I rapidly tired of Hermes always being referred to as ‘the fat man.’ Why not use his name? The only time it appears is when he introduces himself to people. Reading ‘the fat man’ two or three times a page was wearing. He’s fat. I got that the first, the second and the hundredth time it was stated. In terms of plot, this was a book of two halves. I was really hooked by the first half, but the story kind of petered out in the second and the resolution was limp having been signposted from a long way out. Overall, an enjoyable read but didn’t quite fulfil the promise of the first few chapters. 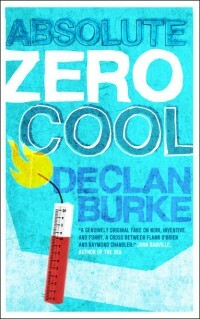 I attended the launch of Absolute Zero Cool by Declan Burke last night in the Gutter Bookshop in Dublin. John Connolly gave it a very nice send off. Also had a good, short chat with Alan Glynn and Decland Hughes. John Banville describes AZC as a cross between Flann O'Brien and Raymond Chandler. I beg to differ. I think it's a cross between Flann O'Brien (the Irish satirist) and Declan Burke (the writer of screwball noirs). If you read the book, that last sentence will make sense. Honest. 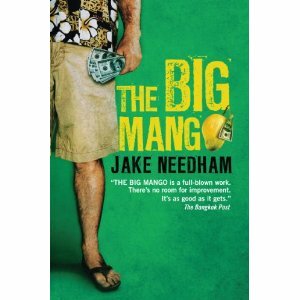 I'm only a hundred pages in, but it's fair to say that this is one of the most original crime fiction books I've read. Probably ever, actually. Along with Duane Swierczynski's Secret Dead Men, it really takes the genre and throws it out the window to take it in a completely different direction. It's erudite, philosophical, clever and funny. So far, so good. Looking forward to the rest. After being gunned down by a death squad, Inspector Lascano is presumed dead. He has been hidden away though to recover by an ambitious cop who appreciates his talents. That cop is about to become Chief of Police and has plans for Lascano. In 1980s Argentina, just emerging from a military state, there are murky forces still operating in the police force. Lascano’s protector is no saint, but his rivals are worse. When the new police chief dies within hours of taking office, Lascano’s life once again comes under threat. Looking to earn money to leave the country, he takes on a job of investigating a bank robbery. He also gets dragged back into the case that led to him being left for dead. Committed to always trying to uphold the law, whatever the consequences and the intended victims, he gets drawn into a deadly game of cat and mouse, making some uneasy and shifting alliances. 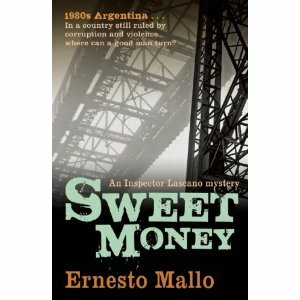 Sweet Money is very much the second book in the Inspector Lascano trilogy and I would recommend reading Needle in a Haystack first. That said, this could be read as a standalone, and very good it is to. The story has a gritty realism, with some very nice prose and good dialogue. My sense is that the translator, Katherine Silver, has done an excellent job at keeping the richness of description in the text. The real strengths of the book are the character development, evocation of the history and politics of early 1980s Argentina, its very well developed sense of place, and the carefully structured and layered plotting. There are a couple of nice twists and turns and a couple of lovely sucker punches, especially the one at the end. Like the first book I found the continuous stream of dialogue, where the reader has to work out when one person has stopped talking and another started, and who is talking, a little bit too much unnecessary work. Other than that, which didn’t really detract from the story itself, I really thought this was an excellent read. One of my favourites for the year so far. A couple of posts recently have led to me having a look at the sources for my reading. Patti over at Pattinase had a post up about how many of the books people start reading they finish. Norm over at Crime Scraps had a poll on the source of the present book being read (as it happens the book I was reading at the time was purchased through Amazon marketplace). Generally, if I start a book and it fits my mood, I'll finish it. I think part of the reason for this is I'm a pretty discriminate chooser books, and as the graph below shows, I buy nearly all my books. I tend to do a little work before parting with my cash. I'm forever trying new authors, but I have a bit of a browse first and trust the opinions of reviewers my tastes coincide with. 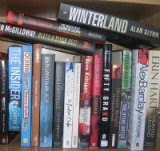 Of the 219 books I've reviewed on The View from the Blue House since July 2009, I have bought 183. I've received 3 from authors direct and 6 from publishers for review. 3 have been loaned to me by friends. 23 were gifts, mostly from a single source and were part of someone's estate. Only one was loaned from the library. Of the 183 that I've bought, 97 were bought off the internet (mostly Amazon, Amazon marketplace, Book Depository and Abebooks), 70 from bookstores and 16 were from charity shops. Generally, books bought on the internet were ones that were difficult to source in Ireland and needed to be ordered in. The ones in bookshops were impulse buys, or I knew I'd be able to source them there. I'm surprised that the balance between bookstore and internet is not the other way around and I'll try and work on that. I know this kind of spending pattern isn't for everyone, but I tend to use my royalty money from my own books for purchasing and I like to know that the author is receiving something for my reading pleasure. I have no idea how much I've spent on books over the past couple of years; I daren't try and work it out. Just been hit in the sweet spot. 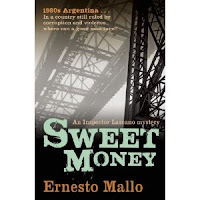 Sweet Money by Ernesto Mallo is a fabulous, multi-textured read. After the gut to the stomach at the end of Ken Bruen's The Dramatist, Mallo ends with a swift kick to the balls. A fine slice of noir, Argentinian style. Review in the coming days. After the fairly dark reading of the past couple of weeks, I think something lighter is in order. Next up was Outrage by Arnalder Indridason and Quarry by Johan Theorin, but I might try and slot something in before them. I don't imagine they're going to be the jolliest of reads. I spent the morning catching up with reading some short noir and hardboiled stories. There's some really good stuff out there. For those interested try these e-zines. All free. All top notch. All take submissions (though some are closed at the minute). Whilst not confined to noir Flash Fiction Friday is an interesting site. Every week it puts up a fresh flash fiction challenge. My plan for the next few months is to try and get one story a month off to some of these great sites. Check them out. Loads of bite-sized, delicious crime nuggets. Jack Taylor is sober and down to five cigarettes a day. He’s as near to clean living as he’s been in years. When a former dealer asks him to help investigate the death of his sister, Jack is reluctant to get involved. Then a second student is found dead, her body accompanied by a book of plays by Synge. Reluctantly, Jack starts to probe and prod, but there are dark forces at work in the town and they either want to sign Jack up to their cause or suffer the consequences. Suffering though is what Jack does best. Ken Bruen’s books are dark and brooding affairs, written in a sparse, engaging literary prose. For me, sometimes the text feels a little too sparse, begging for a little more elaboration, but they are nonetheless engaging, powerful, layered tales. His stories rarely have complex puzzles, they are more structured as unfolding. 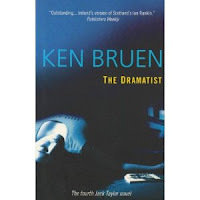 The Dramatist is no different. In it he demonstrates a keen observational eye, capturing the nuances of Irish society, especially the intricacies of inter-personal relations. There’s a strong sense of place and the plot has some nicely interwoven strands and intertextuality. The resolution of the crimes is relatively straightforward, but that’s hardly the point of his stories: they are about the journey not the destination. Though in The Dramatist, the destination is a powerful punch to the gut, despite it being well signposted. A fine slice of Irish noir. Whilst I'm posting about newly published books. The Cosy Knave has just been published by Dorte Hummelshoj Jakobsen and I recently received an electronic review copy of Where the Sun Don't Shine by Alex Metcalf. 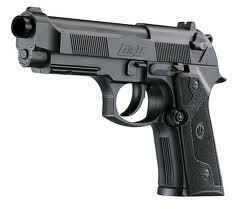 Kind of sound like polar opposites - cozy versus hardboiled. Take your pick. Here are some details. 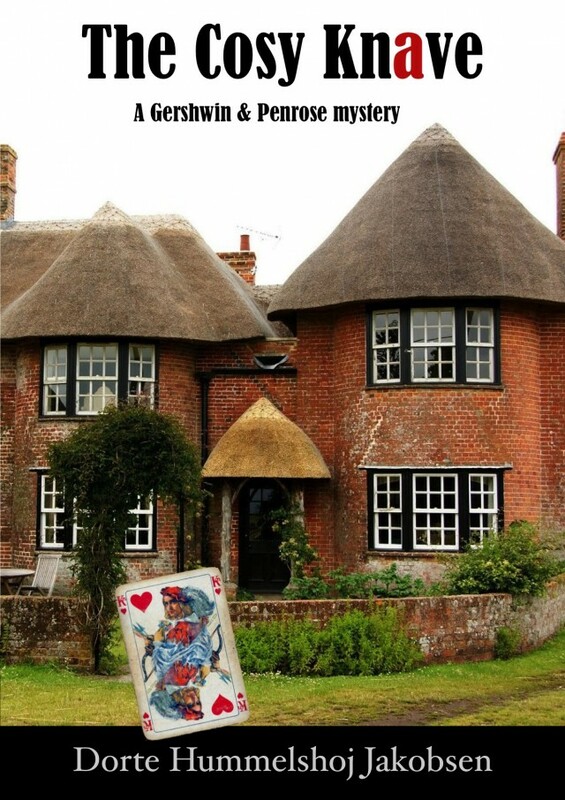 A humorous cosy mystery, set in Yorkshire 2010. The vicious attacks begin when the prodigal son of Knavesborough, Mark Baldwin, returns to the sleepy village after forty years in Argentina, fully equipped with fame, fortune and effeminate butler. Small wonder that the spiteful nosey parker Rose Walnut-Whip is stabbed, but how could the murderer get away with shattering the perfect, English tearoom idyll in front of twenty villagers? Constable Archibald Penrose is in dire need of assistance as his superior, DI Mars-Wrigley, is preoccupied with England´s chances in the football world cup. Penrose´s enthusiastic fiancée, the mint-new librarian Rhapsody Gershwin, is more than willing to help as she sees this as Penrose´s route to promotion (and a welcome raise). As she is the vicar´s daughter, Rhapsody´s treasure trove of local knowledge may come in handy, and to be perfectly honest, the young sleuth may also be a tad curious. And of course the crimes do not stop here. A dangerous criminal is on the loose in Yorkshire. Can the young couple stop the perpetrator in time? Just another day at Venice beach. 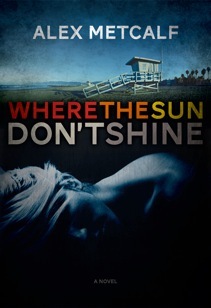 Where The Sun Don't Shine is the story of Marley, a once successful Hollywood player who's tumbled so far down the ladder of success that he’s got almost nothing left. Just a one room apartment on Venice Beach and a fragile relationship with his 16 year old daughter. 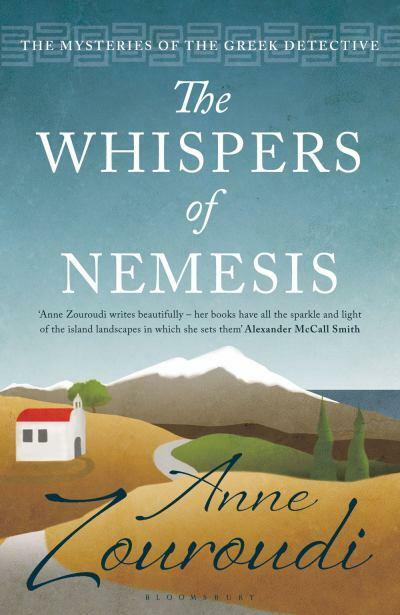 A book arrived in the post today courtesy of Bloomsbury - The Whispers of Nemesis by Anne Zouroudi. I've not read any of her previous books but I'll give this one a go. 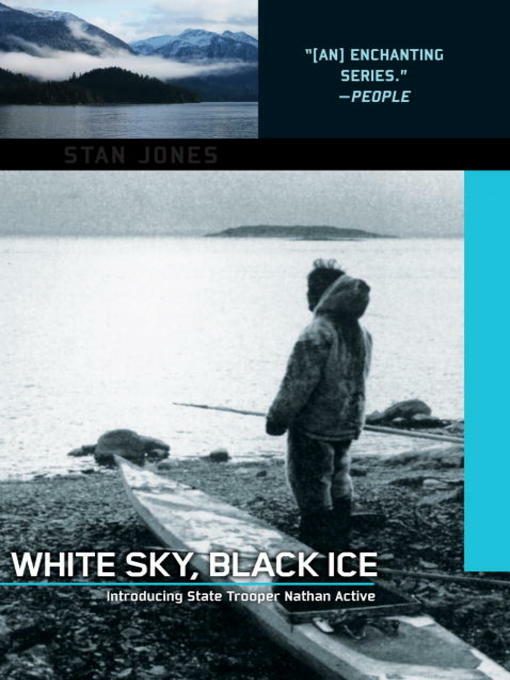 The cover and blurb look good and it would be nice to engage with somewhere that actually sees the sun and experiences blue skies (even in winter). Here's the blurb. Review sometime in the next month or so, hopefully. It is winter in the mountains of northern Greece and as the snow falls in the tiny village of Vrisi a coffin is unearthed and broken open. But to the astonishment of the mourners at the graveside, the remains inside the coffin have been transformed, and as news of the bizarre discovery spreads through the village like forest fire it sets tongues wagging and heads shaking. Then, in the shadow of the shrine of St Fanourios (patron saint of lost things), a body is found, buried under the fallen snow - a body whose identity only deepens the mystery around the exhumed remains. There's talk of witchcraft, and the devil's work - but it seems the truth, behind both the body and the coffin, may be far stranger than the villagers' wildest imaginings. Hermes Diaktoros, drawn to the mountains by a wish to see an old and dear friend, finds himself embroiled in the mysteries of Vrisi, as well as the enigmatic last will and testament of Greece's most admired modern poet. The Whispers of Nemesis is a story of desperate measures and long-kept secrets, of murder and immortality and of pride coming before the steepest of falls. A relatively slow month of reading. I spent most free time either writing dictionary entries or the new novel. My read of the month was Crime Always Pays by Declan Burke. A screwball noir to savour. His new novel - Absolute Zero Cool - is out August 10th and I'll hopefully have a review up by mid-month. Looking forward to getting my hands on it.